Author sheila365Posted on 08/13/2016 08/14/2016 Categories Austin Images, Field Trip, inspiration, LifeTags 365 project, Austin, photoblog, photography, University of Texas, university of texas tower, UT TowerLeave a comment on Towering. I was on campus tonight to join an old college roommate and her family watch one of her daughters in a dance competition. And her team won! I caught a quick shot of the UT Tower. It is lit up in orange tonight; for Honors Day. Hook ’em! By the way, if you ever want to know what the occasion is for a lit up tower, checkout this link. 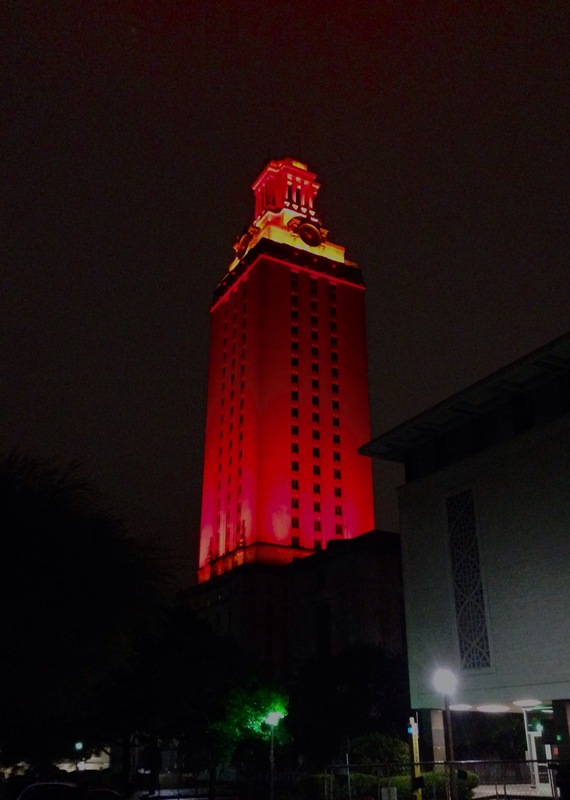 And a background on the university tradition of lighting the tower here. Author sheila365Posted on 04/16/2016 Categories Austin Images, Fun, LifeTags 365 project, Austin, photoblog, photography, University of Texas, UT TowerLeave a comment on Eyes of Texas. Today was another welcome, wonderfully drizzly day. We just need another 100 or so days like it. My cousin graduated from the University of Texas yesterday with his bachelor’s in Electrical Engineering. Today we drove to his parents’ house in San Antonio to celebrate with him, his family and friends. On the way home we could see the UT Tower lit up in burnt orange from I-35. 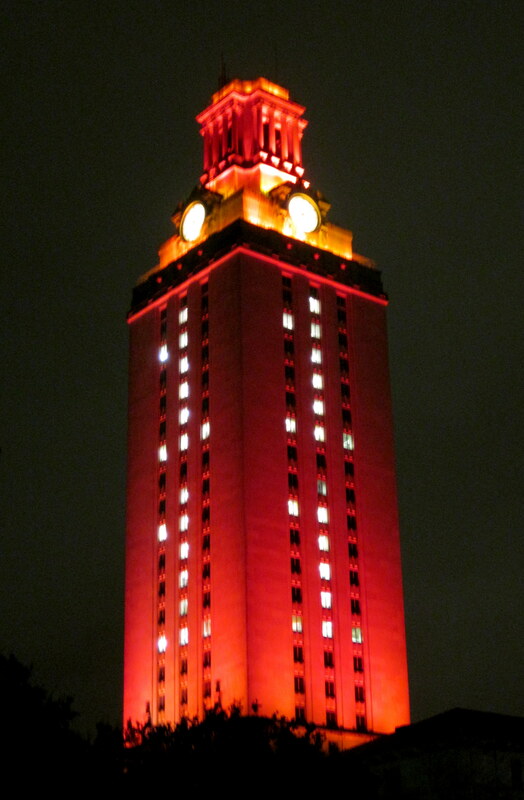 But today, instead of the #1 on the tower, reserved for times when the Longhorns win a national championship, there was a #11, to honor the class of 2011. Monte drove me around to at least 3 different vantage points on campus to try to get a decent shot. This was the best one I captured. Congratulations to all the new Texas-Ex’s! Author sheila365Posted on 12/04/2011 01/23/2012 Categories Austin Images, Family, LightTags 365 project, Austin, Class of 2011, photoblog, photography, postaday2011, postaweek2011, University of Texas, UT Tower1 Comment on The Eyes of Texas. We took a trip through the UT campus today, so Julie would know her way around when she comes back for a meeting tomorrow. The campus is really nice. Today is the Labor Day holiday, so there was not much traffic or people milling about (except for the person I captured in this photo, apparently). This is a shot from the South of the UT Tower and the Main Building in front of it. The inscription across the top of the Main Building says “Ye shall know the Truth and the Truth shall make you free.” Amen. We also drove a bit around downtown and south of the river, through Zilker Park — stopping for the mandatory Sno-Beach sno-cone (the best sno-cones in the entire world, by the way).